Avithor Bird Away Visual & Olfactory Bird Repellent is 100% natural and pesticide free. 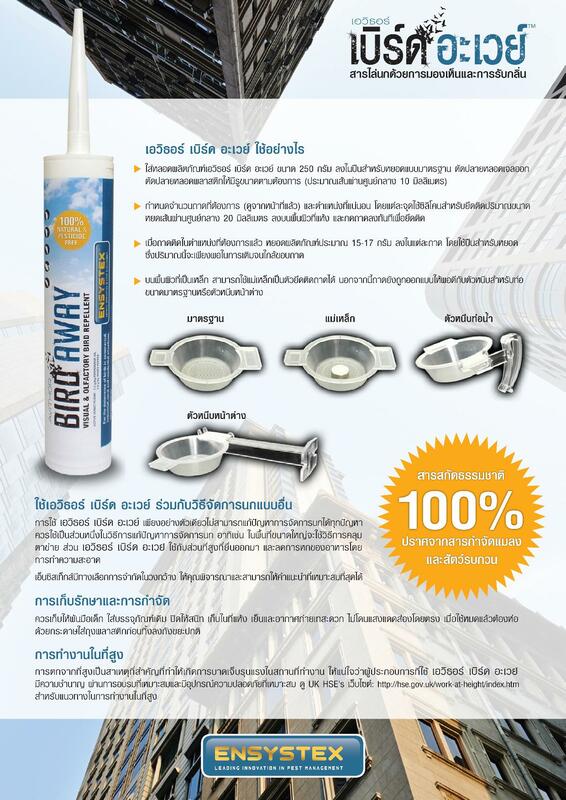 It is discreet, non-harmful and highly effective at repelling birds from buildings and other structures. AVITHOR uses Flame Shield Gel Technology™ to repel pest birds. AVITHOR Bird Away gel reflects light as a sparkle in the UV-A light spectrum. Since birds see light in the UV-A spectrum, they see the sparkle which resembles flames. This virtual ‘flame shield’ visually deters the birds from landing. When first applied, especially in high pressure areas, some birds will challenge the flame shield, this is when the olfactory component of the gel comes into play. 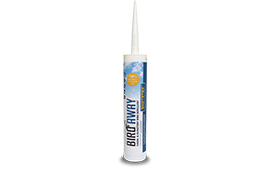 AVITHOR Bird Away contains herbal extracts in a natural product base. If the bird gets close, it is repelled by the strong herbal odour. In the presence of AVITHOR Bird Away, birds will also sound a warning signal to other birds, which provides additional auditory repellence. 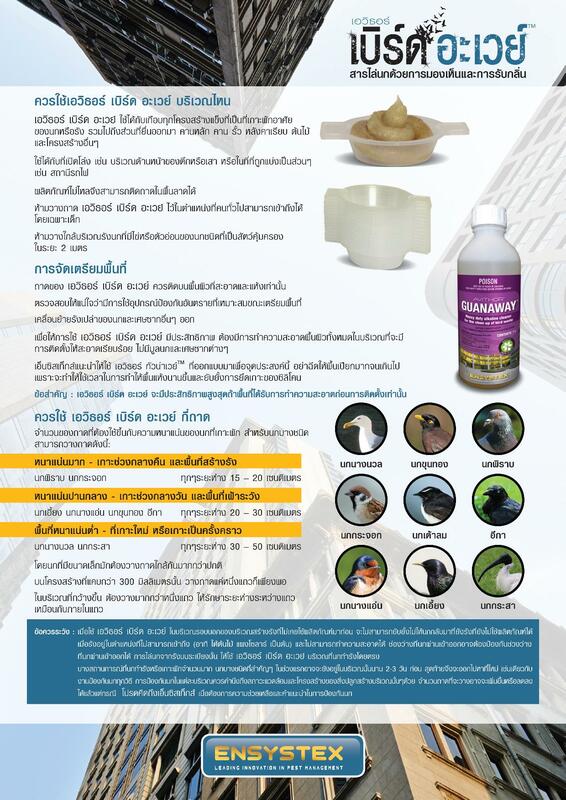 AVITHOR Bird Away is non-toxic and non-harmful to birds. Most importantly, the birds do not make any contact with the gel at all. It works purely by visual and olfactory cues. The gel is discreetly applied in supplied UV stabilised, low-profile AVITHOR Dishes for placement. It does not kill or trap birds, but immediately changes their behaviour so that they fly away. Birds will completely desert a habitat they have been using for years once it is placed. It remains effective for up to two years, or more. AVITHOR Bird Away is an all-natural product and contains no pesticides. All components appear on the United States Food and Drug Administration’s (FDA) lists of products that are Generally Regarded As Safe (GRAS); and are listed in the European Pharmacopoeia Standards, (Europe’s legal and scientific benchmark for pharmacopoeial standards, designed to deliver high quality medicines in Europe and beyond), for direct application to, or consumption by, people. AVITHOR Bird Away works indoors or outside, and has been tested successfully against pigeons, common mynahs, starlings, sparrows, swallows, willie wagtails, gulls, crows and corellas; with birds deterred for two years or more. Correct placement of the AVITHOR Dishes in accord with the Avithor Bird Away Installation Manual is essential.